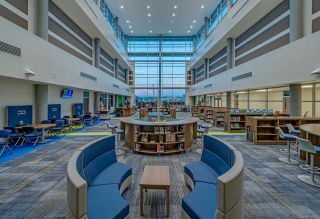 When the Humble Independent School District built a new STEAM-focused middle school, they decided that student collaboration didn’t have to end at the classrooms’ walls. When we talk about collaboration in schools, we often default to thinking about collaboration within an individual classroom, but schools are made up of many classrooms and libraries and lunchrooms—and even non-spaces, like the technological infrastructure and the communication tools we use to address students, teachers, and parents. At Humble Independent School District, when it came time to build a new middle school, we took the opportunity to put this broader understanding of collaboration into practice. Our new school, West Lake Middle School, is a STEAM-focused school with an emphasis on project-based learning. The first thing that means is that we are not, as a school, afraid of technology. All of our teachers have laptops to enable them to move around the room with their computers as they teach and facilitate learning. We’re working on raising funds to launch a 1:1 computing initiative, but in the meantime, we are at about one device for every four students. We also allow students to bring their own devices. As a STEAM school, part of our goal is working to develop students who are excited about technology and using it in creative and imaginative ways. That’s easy enough to say, but designing a school that enables it is both an opportunity and a challenge. The first step in unleashing student creativity is providing the right environment. In the past, schools have tried to force learners to conform to the design of the classroom. That seemed backwards to us, and so we took flexible design as our first guiding principle in creating a school that would conform to our learners. Inside the classroom, we use furniture provided by Hon and Mien via School Specialty, who took care of ordering, check-in and assembly of everything. Students can choose to sit on exercise balls or tall café-style chairs. Our movable desks can easily be arranged together in multiple configurations for group work or used separately for individual study. In keeping with our belief that collaboration should not end at the edge of the classroom, we also included collapsible walls for the option to extend some classes and glass walls to eliminate the barriers where others ended, along with an open-air environment for Socratic seminars on the first floor. On the second floor, we included another open-air environment for conducting science experiments and other learning activities that require more space and freedom. The third floor also includes an open-air learning environment for activities such as an egg drop to study physics concepts like velocity. The solution we found, Vivi, quickly became a key piece of our whole-school collaboration model. In addition to allowing students and teachers to wirelessly present from any device they have on hand, it allows us to make announcements to the whole school or select classrooms. We’ve tied it into our public-address tool and it’s even replaced our bell system. Before Halloween, to signal the transition between classes, instead of a bell we played songs like “Monster Mash,” “Thriller,” and the Scooby Doo and Addams Family theme songs. The last, but certainly not least, piece of a collaborative school environment, is of course the teachers. I was lucky in that our district is growing so fast that I had the pick of the litter when making staffing decisions for our school. In my staffing search, I was able to begin the conversation by explaining the vision and asking what applicants thought of it and how they could contribute to it. There are no right answers to those questions, but they did help to reveal the one characteristic that is vital to developing self-directed and creative learners: a willingness to take risks. Today we have a school in which the teachers are able to model that willingness, and in which the students are able to do the same for one another, whether it’s by sharing their work on a screen, looking from one classroom to another to see their peers diligently at work, or by watching a classmate run an experiment over and over in one of our open-air learning spaces. Dr. Ken Hodgkinson is the principal at West Lake Middle School. With more than two decades of school administrative experience, Dr. Hodgkinson has presided over the opening of two new schools. He can be reached at Kenneth.Hodgkinson@humbleisd.net.